We are currently a vendor at several outdoor markets. The North Union Farmer’s Market sets up shop on Saturdays at Crocker Park. Other summer markets run from June thru October at the Cleveland Clinic, University Hospital & Chagrin Falls! NUFM feature the best in fresh. local vegetables, fruits, flowers, potted plants, bedding plants, poultry, maple syrup, eggs, honey, pork, baked goods, dairy products, grass-fed beef, and more. Now accepting SNAP (Supplemental Nutrition Assistance Program) EBT Cards at all of our market locations. Visits to the outdoor markets have become a weekday/weekend tradition for many fans and we are very happy to be a part of this organzation. It is a great opportunity for us to sell directly to folks who love farm fresh fruits, vegetables, etc. Market Hours: The market is open every Saturday from 9:00am – 1:00pm RAIN or SHINE. We will be selling June 2nd thru September 22nd, 2018! Location: E. 100th & Carnegie Avenue, across for the Intercontinental Hotel. Market Hours: Open every Wednesday from 10:30am – 1:30pm RAIN or SHINE! Beginning June 6th thru September 26th, 2018! Location: Held in Franklin Spur on Main Street next to Gazebo Triangle Park. Market Hours: Open every Sunday from 10:00am to 1pm RAIN or SHINE! Beginning June 3rd thru September 23rd, 2018! Market Hours: Every Thursday from 10:30-1:30 RAIN or SHINE! Beginning June 7th thru September 27th, 2018! 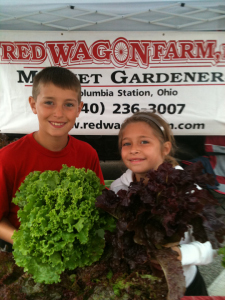 Market Hours: Every Saturday from 9:00-1:00pm RAIN or SHINE! Beginning June 2nd thru September 22nd, 2018!